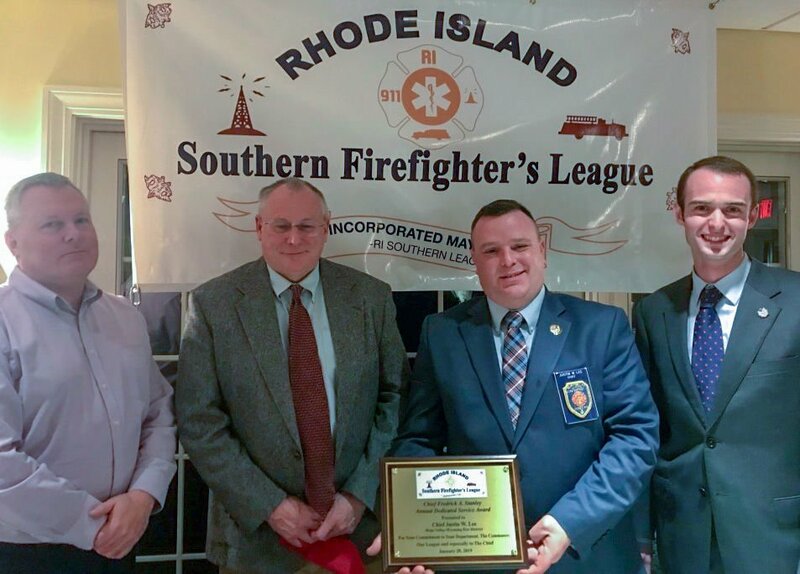 HOPKINTON — The Rhode Island Southern Firefighter's League has bestowed its first Frederick A. Stanley Dedicated Service Award to Justin Lee, who took over from Stanley in 2015 as chief of the Hope Valley-Wyoming Fire Department. The award was presented during the league's Legislative Night ceremony in late January. "It's humbling to even be considered," said Lee, who succeeded Stanley upon the former fire chief's retirement. "His dedication to our community and our fire services was unprecedented. It was his whole life; he gave up everything for us." Stanley served his community for nearly 65 years, and received the league's service award himself a year ago, shortly after announcing that he was ending his long run as its president. The award was then renamed in his honor. Stanley was fire chief for Hope Valley-Wyoming from 1964 until 2015, and had remained active on state and regional committees until last year. Lee joined the fire district and its department in 1995 after he arrived in the area to work as a ranger at Camp Yawgoog. He and his wife, Gina, a teacher at the Ashaway Elementary School, and their three children, are residents of the community. 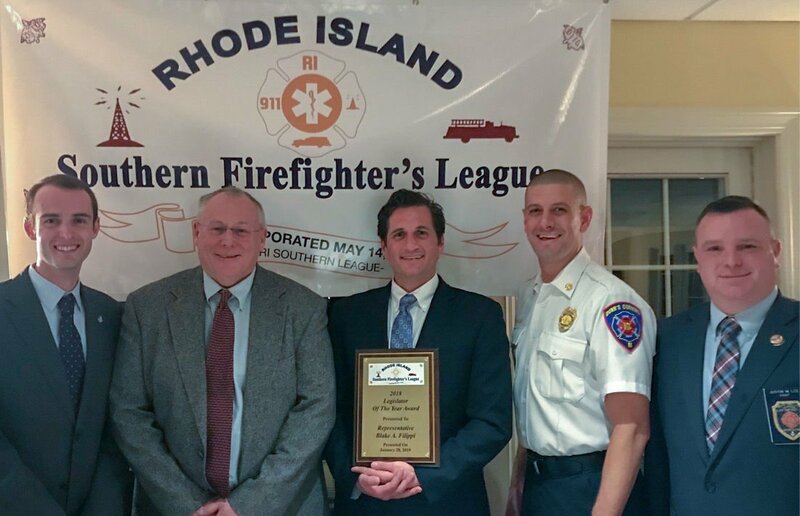 Lee said that the award could have been given to "any chief" in the southern Rhode Island area. He said he serves alongside others "just as dedicated," and credited the men and women who volunteer throughout the region for their efforts in helping to keep fire services moving in the right direction. Lee was named as the Hope Valley-Wyoming Fire District's firefighter of the year in 2007, and volunteer of the year in 1999 and 2002. He also received the department's dedicated service awards in 1997, 2004 and 2013, and special service awards in 1998 and 2006. Lee said he hopes to build on Stanley's accomplishments. "When you look at everything he's done, what he brought to the southern league and state associations, Chief Stanley was always at the forefront of firefighter safety and training," Lee said. "I only hope to be able to continue his legacy." At its Legislative Night, the league also recognized House Minority Leader Blake Filippi, 38, as Legislator of the Year. Filippi serves the 36th district, which includes Block Island, Charlestown, and parts of South Kingstown and Westerly. Filippi was nominated by Dunn's Corners Fire Chief Christopher DeGrave. The chief praised Filippi's accessibility, calling him "a breath of fresh air" in today's politically charged environment. "In our little corner of the state, we are closer to the Connecticut line than we are to Providence. Our volunteers are often overlooked by politicians," DeGrave said. "Blake is a younger guy with a progressive take. We may not always see eye to eye, but he is always willing to listen and help our volunteers. That's exactly what this award is supposed to be about."